Heliophysics is a term to describe the study of the Sun, its atmosphere or the heliosphere, and the planets within it as a system. As a result, it encompasses the study of planetary atmospheres and their magnetic environment, or magnetospheres. 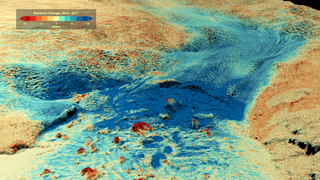 These environments are important in the study of space weather. As a society dependent on technology, both in everyday life, and as part of our economic growth, space weather becomes increasingly important. 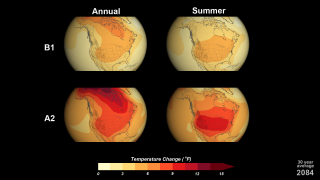 Changes in space weather, either by solar events or geomagnetic events, can disrupt and even damage power grids and satellite communications. Space weather events can also generate x-rays and gamma-rays, as well as particle radiations, that can jeopardize the lives of astronauts living and working in space. 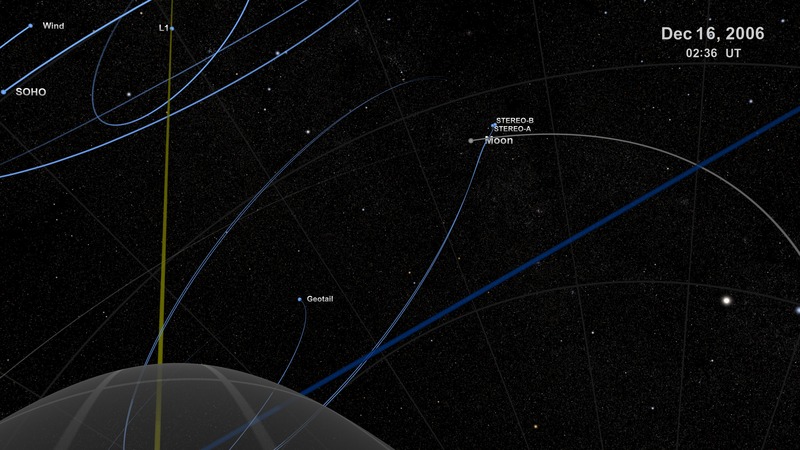 This visualization tours the regions of near-Earth orbit; the Earth's magnetosphere, sometimes called geospace; the region between the Earth and the Sun; and finally out beyond Pluto, where Voyager 1 and 2 are exploring the boundary between the Sun and the rest of our Milky Way galaxy. Along the way, we see these regions patrolled by a fleet of satellites that make up NASA's Heliophysics Observatory Telescopes. Many of these spacecraft do not take images in the conventional sense but record fields, particle energies and fluxes in situ. 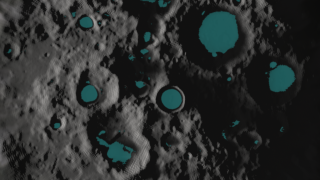 Many of these missions are operated in conjunction with international partners, such as the European Space Agency (ESA) and the Japanese Space Agency (JAXA). 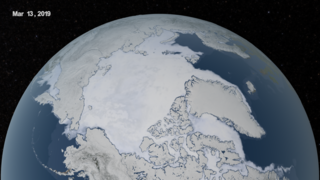 The Earth and distances are to scale. 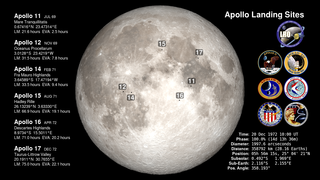 Larger objects are used to represent the satellites and other planets for clarity. 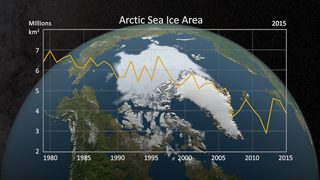 TIMED: Studies the upper layers (40-110 miles up) of the Earth's atmosphere. 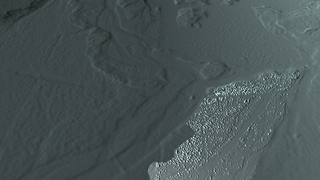 FAST: Measures particles and fields in regions where aurora form. CINDI: Measures interactions of neutral and charged particles in the ionosphere. 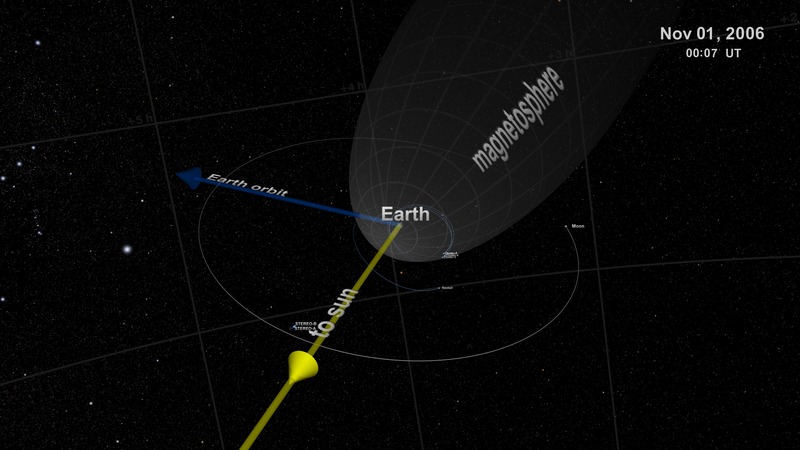 Geotail: Conducts measurements of electrons and ions in the Earth's magnetotail. 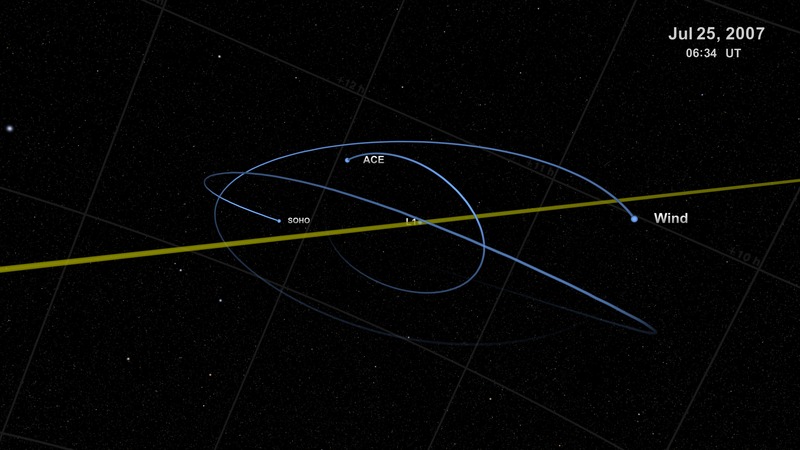 ACE: Measures the composition and characteristics of the solar wind. Wind: Measures particle flows and fields in the solar wind. 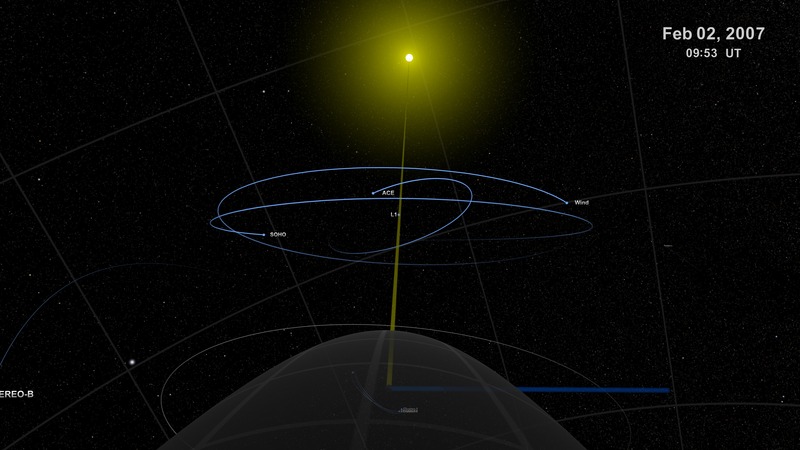 A refined and narrated version of this visualization, Sentinels of the Heliosphere, is now available. 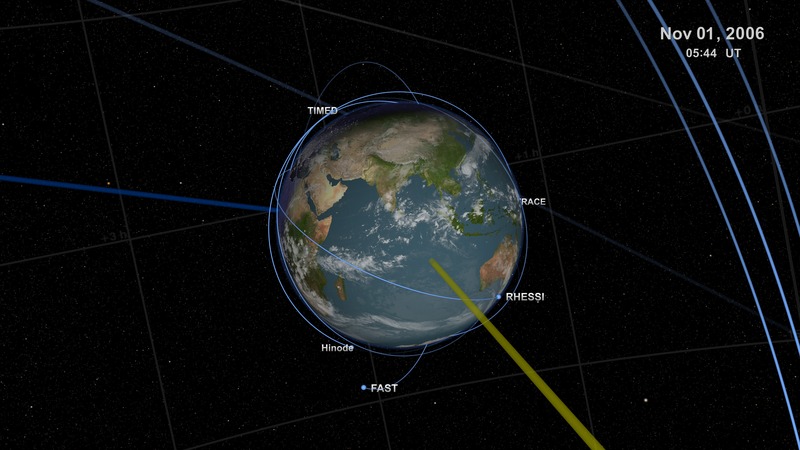 This movie shows the orbits of the fleet of NASA spacecraft exploring the heliosphere. 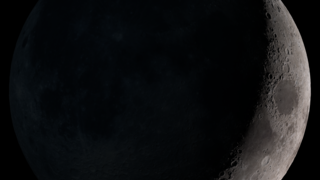 The movie opens on the date of November 1, 2006, with a view of the inner Solar System. 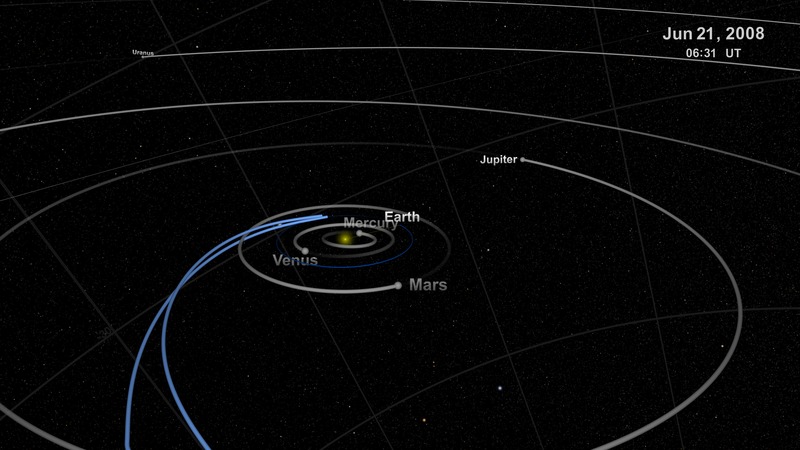 We see the Sun, as well as the orbits of Mercury, Venus, Earth (in blue) and Mars. We zoom in towards the Earth. 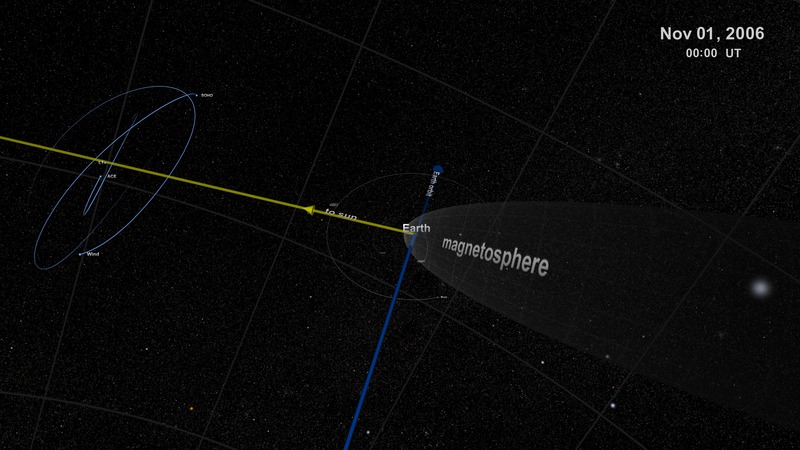 As we approach the Earth, we get a wide view of the spacecraft located at L1 as well as the Earth nestled within the magnetosphere. The magnetosphere forms due to the interaction of the Earth's geomagnetic field with the plasma of the solar wind. Solar wind pressure drags the magnetosphere back from the Earth, away from the Sun, much like a 'wind sock'. 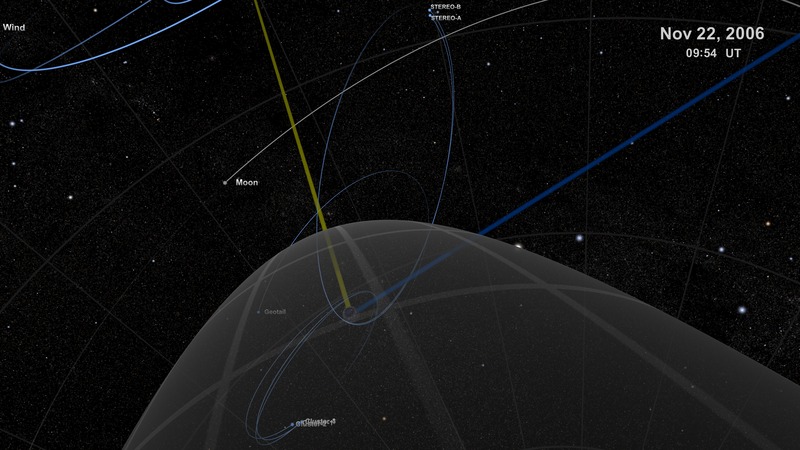 For convenience, arrows remind us of the direction of the Sun (yellow) and the direction that the Earth travels along its orbit (blue). 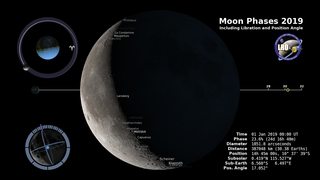 Moving closer to the Earth, we see the orbit of the Moon. 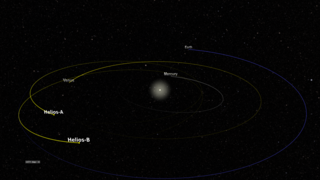 We also see the orbits of several spacecraft in the region between the Earth and the Moon's orbit. We fly throught the boundary of the magnetosphere for a closeup view of the Earth (note that the clouds are changing, updating based on weather satellite imagery from this time). 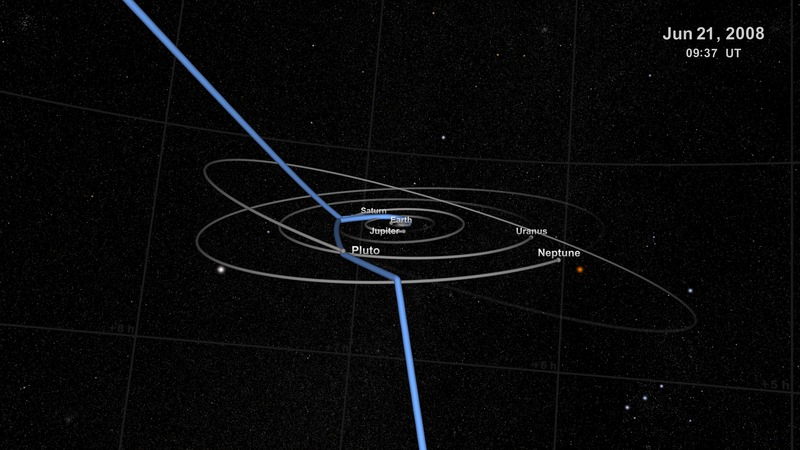 We also see the orbits of heliofleet satellites that occupy near-Earth orbit. Here, the fleet include not only Earth-observing missions like TIMED and FAST, but solar observatories as well: TRACE, RHESSI, and Hinode. Passing back through the boundary of the magnetosphere, we can now see the satellites, Geotail and Cluster, that patrol this region measuring the particles and fields. 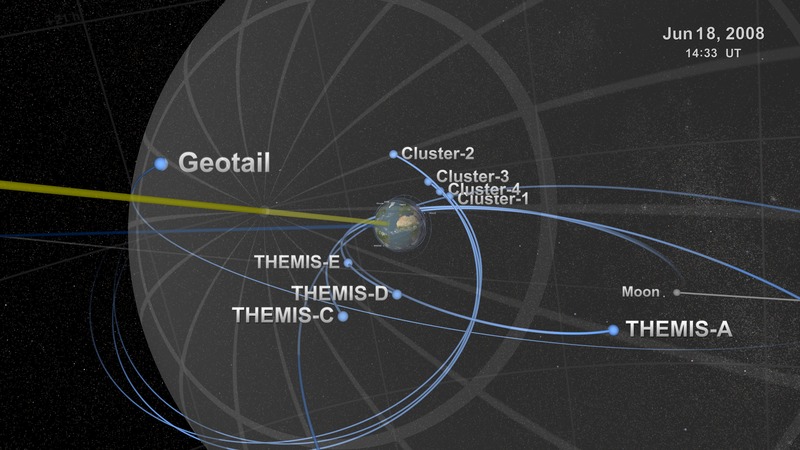 Cluster (actually Cluster II), is a group of four identical satellites that fly in formation through this region. 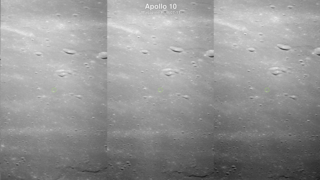 As we continue our pull-out, we see the two STEREO satellites, STEREO-A and B, shortly after launch, while still in their post-launch phasing orbit which travels from the Earth to the orbit of the Moon. Here we get a geospace family portrait: the Earth and Moon, as well as the satellites Cluster, Geotail, and STEREO-A and B. 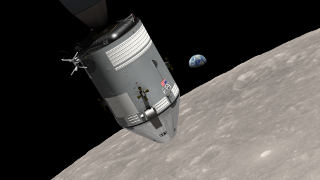 The spacecraft STEREO-A and B make their first lunar flyby, using the Moon for a gravity-assist. 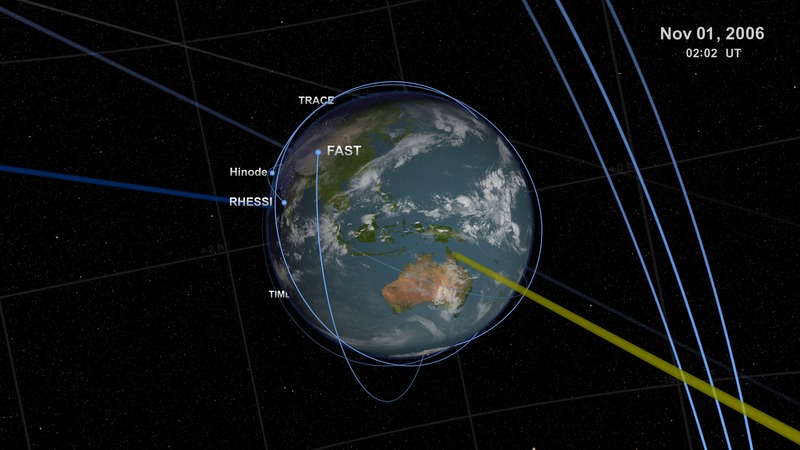 For STEREO-A, the flyby transfers enough momentum to send the satellite into a solar orbit, slightly closer to the Sun than the Earth. 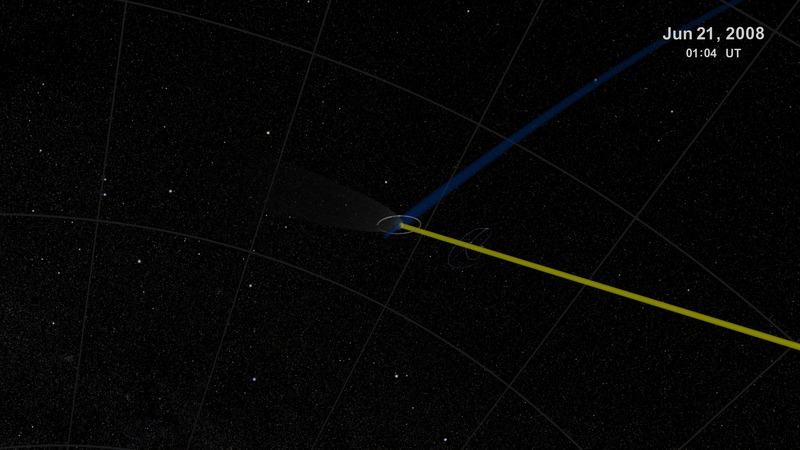 From this orbit, STEREO-A becomes STEREO-Ahead as it begins to move ahead relative to the Earth in its orbit. 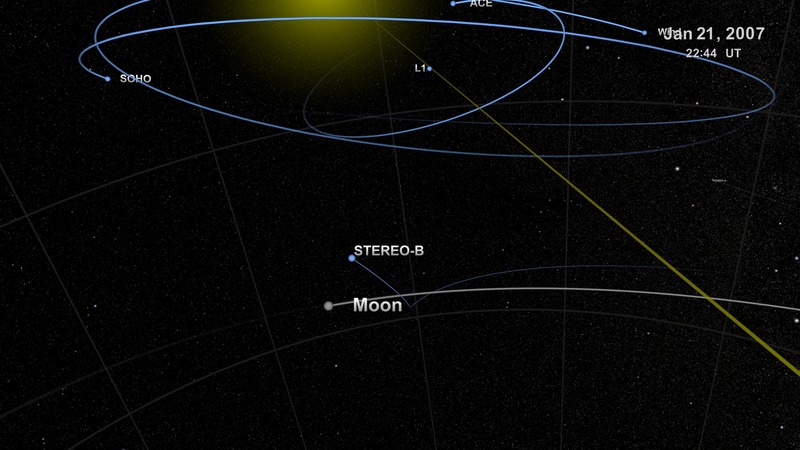 The Moon completes another orbit before it encounters STEREO-B for its second lunar flyby. 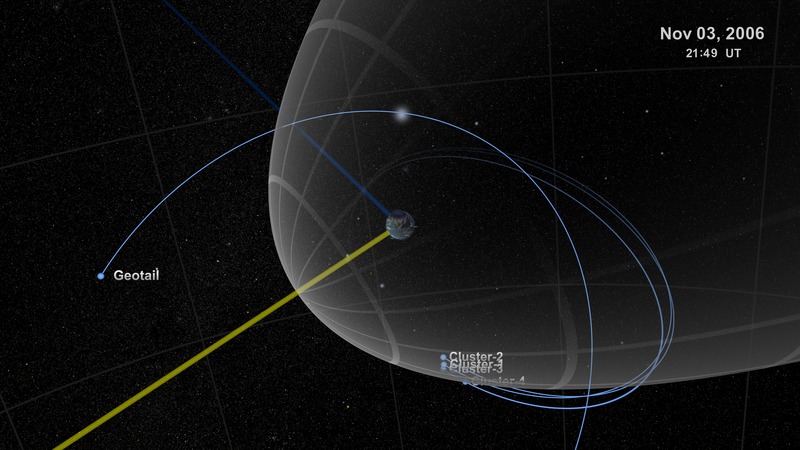 This encounter sends STEREO-B into an orbit further from the Sun than the Earth, where STEREO-B will become STEREO-Behind as it drops behind the Earth in relative position along its orbit. 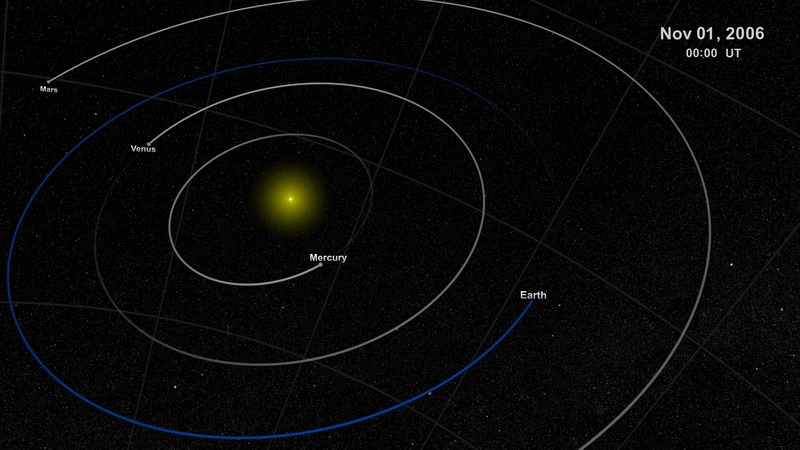 From a vantage point 'above' and 'behind' the Earth, we look sunward to the three spacecraft that 'orbit' around an empty point in space - the Sun-Earth Lagrange Point, L1. 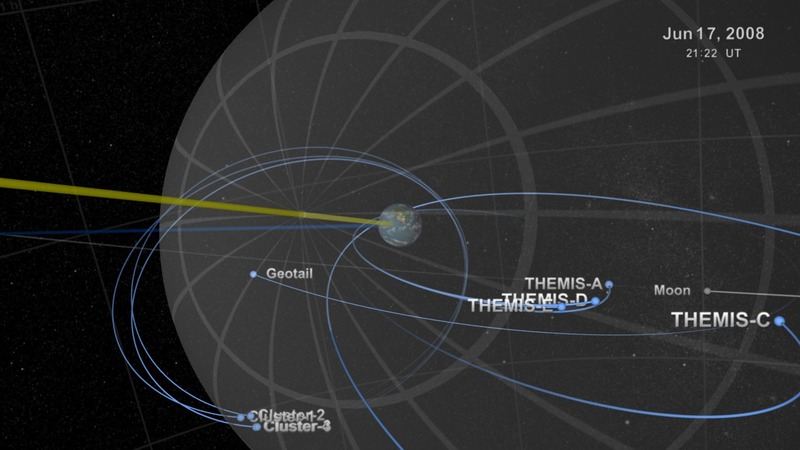 Returning to the geospace around the Earth, we see a new mission has come on the scene - THEMIS, with five identical spacecraft, travel in a series of aligned elliptical orbits to sample the Earth's magnetotail at different distances. 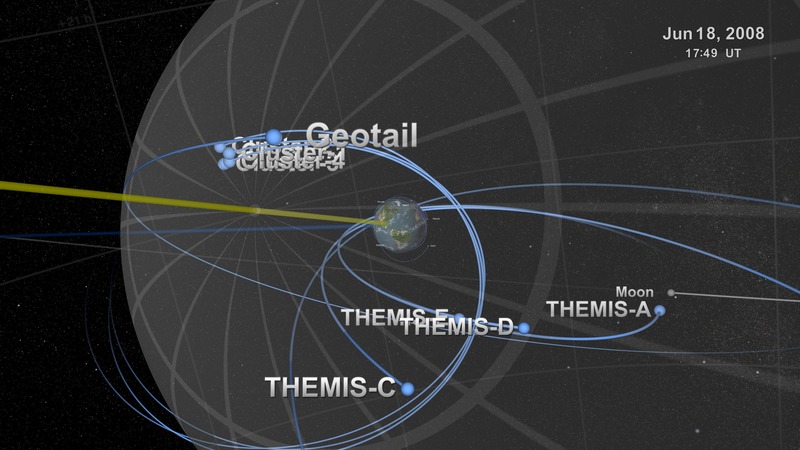 We continue our approach to Earth, and observe the region patrolled by THEMIS, the five satellites designated with the letters A through E.
Special version (more readable) rendered for SIGGRAPH2009 submission. Passing through the magnetosphere again, we see two new missions in near-Earth orbit: C/NOFS carries the CINDI instrument for observing the ionosphere while AIM observes noctilucent clouds. 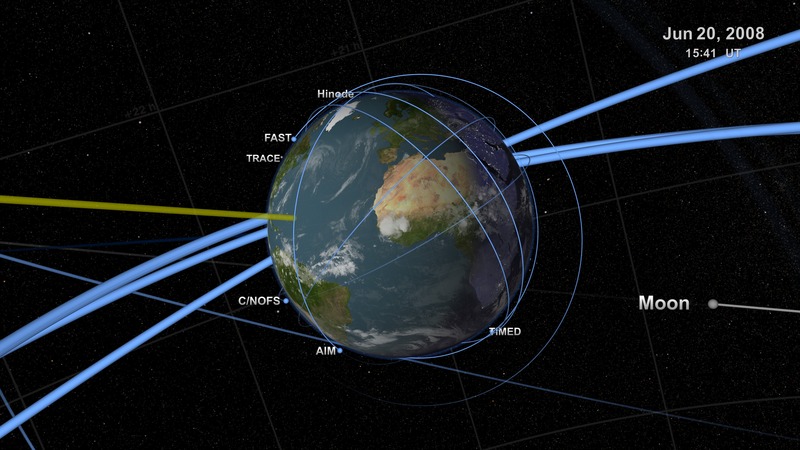 Two light blue paths appear, terminating on the orbit of the Earth. 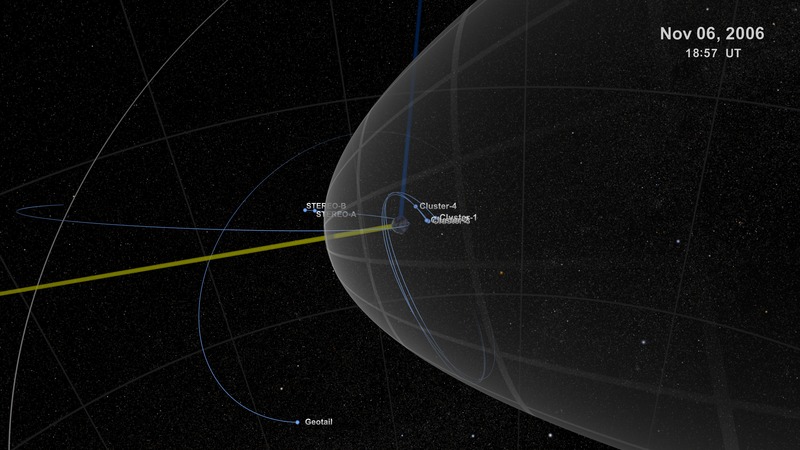 They represent the trajectories of Voyager 1 and Voyager 2, launched in September and August, respectively, of 1977. 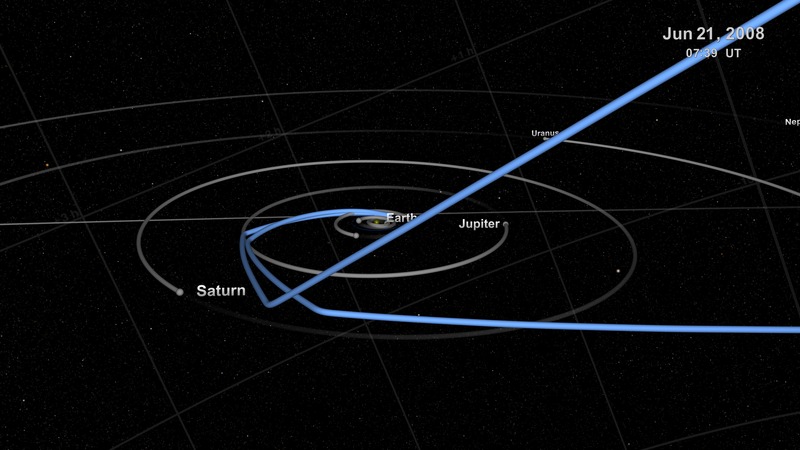 We see the changes in the trajectories of the Voyagers as they cross the orbits of the giant planets Jupiter and Saturn. 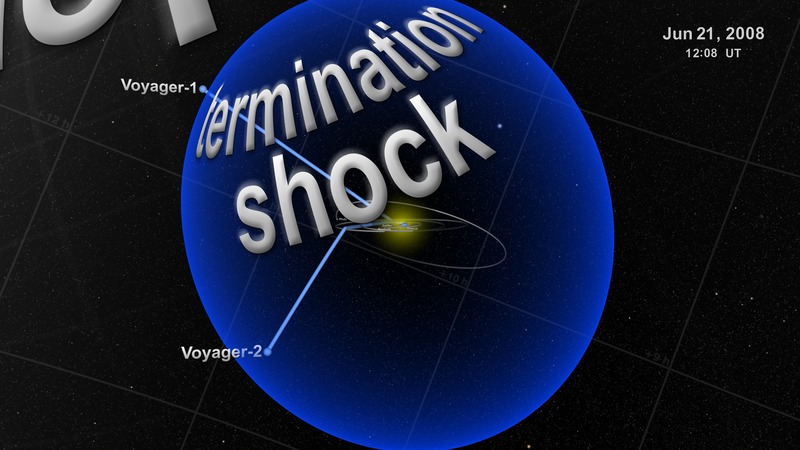 With the Saturn encounter, Voyager 1 is sent out of the plane of the Solar System, called the Ecliptic. Voyager 2 continued in the Ecliptic, making historic flybys of the planets Uranus and Neptune, The Neptune flyby is used to direct Voyager 2 below the Ecliptic, enabling it to explore a different region than Voyager 1. 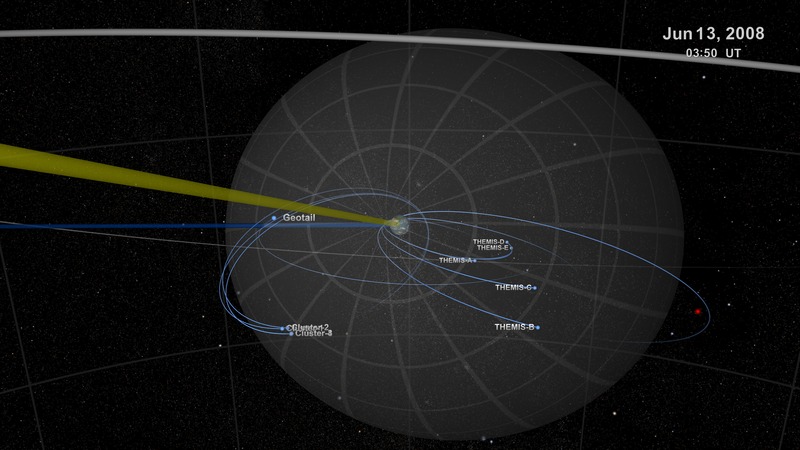 It is now believed that both Voyagers have crossed the termination shock for the helipause, the innermost boundary that separates the environment of our Solar System from the interstellar medium. 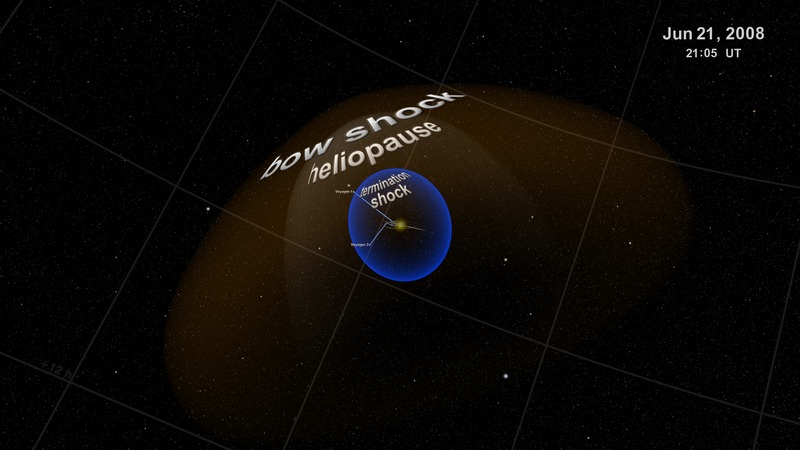 The heliopause and the bowshock are the two remaining 'surfaces' for the Voyagers to cross, the regions defined by characteristics of the solar wind's interaction with the interstellar medium. The transmitters on the Voyagers are expected to still be operating when they cross the heliopause, estimated to be around 2015.